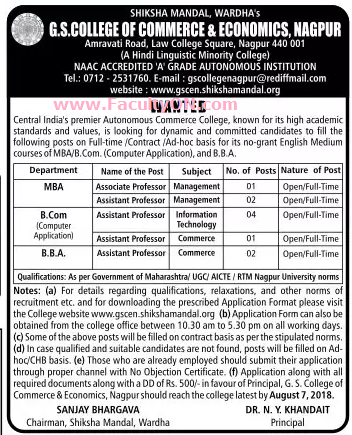 G.S College of Commerce and Economics, Nagpur has advertised in the LOKSATTA newspaper for the recruitment of Associate Professor / Assistant Professor jobs vacancies. Interested and eligible job aspirants are requested to apply on or before 07th August 2018. Check out further more details below. About College: G.S. College of Commerce and Economics, established in 1945, is one of the general degree college in Nagpur, Maharashtra. This college offers undergraduate and postgraduate degree courses in Economics and Commerce. Application Form: Rs.500 as DD and can be collected in the college office between 10:30 am to 5:30 pm on all working days. How to Apply: Interested and eligible candidates are requested to send their application in full details along with copies of certificates / mark sheets and recent PP size photos along with aplication fee DD of Rs.500/- to the following postal address.